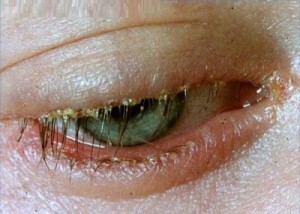 If you suffer from trichiasis, it means you have ingrown eyelash hair. It may happen on the upper or lower lid, and it’s caused when your eyelashes curl and grow back into your skin. Needless to say, this causes quite a bit of discomfort. When you have an ingrown eyelash, it may form a bump that looks like a pimple on the eyelash line or eyelid. A few of the symptoms are eyelid pain, swelling and hair that scratches the cornea. The eyelash growing abnormally can cause blurred vision, watery or sore eyes or red eyes, and infections and ulcers in your eye. Read on for more symptoms, along with causes and treatments. What do ingrown eyelash hairs look like? Ingrown hair is not uncommon on any area of your skin that has hair. The bumps will occur after you shave, and one or more follicles curl and grow back into the skin. When you have an ingrown eyelash, the lash grows into the skin, irritating the eyelash rim and the skin of the eyelid. What are the causes of ingrown eyelashes? Nearly anyone may suffer from ingrown eyelashes. They’re more common in adults. The causes include autoimmune disorders, eye inflammation and eye infections. In addition to eyelashes growing abnormally, you may have styes, which are bumps like pimples on the eyelid. These can sometimes occur because of ingrown eyelashes. In addition, eyelash lines and eyelid glands may become infected. This infection may spread to eyelash roots, altering their normal pattern of growth. Pores near the eyelid rims and eyelid may become infected. 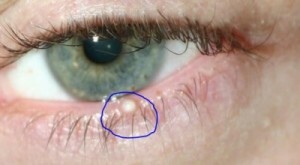 Cysts and swelling may obstruct the normal outward eyelash growth. Blepharitis is often a precursor to trichiasis. If your eyelid rim becomes inflamed, it is known as blepharitis. It is typically related to a disorder of the Meibomian gland. This gland supplies the eye with meibum, which is an oil-like substance that works to prevent evaporation of your eye’s film of tears. 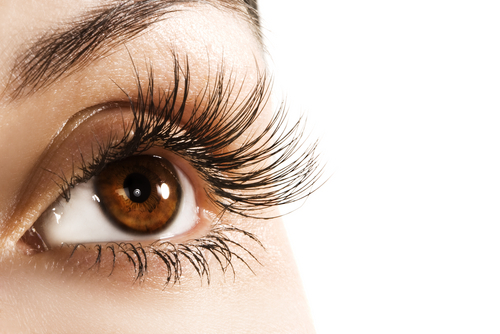 A number of eye-related autoimmune disorders may cause eyelashes to grow inward. They include Lupus, Vernal keratoconjunctivitis (VKC) and Stevens-Johnson Syndrome (SJS). Inflammation of your eyes or eyelids is often associated with lupus, reports Everyday Health. Other symptoms associated with autoimmune disorders include trichiasis, blurry vision, dry eyes, light sensitivity and sore eyes. Some types of injury or trauma may damage the eyelash line and eyelid. If your eyelid becomes torn near its rim, or in the line where your eyelashes grow, the skin may deform. Most injuries to the eyelid occur when an eyelid wound heals in a position that is misaligned. If you have a case of psoriasis near your eyes, it can cause the eyelids to become inflamed. It occurs when skin cells build up too rapidly. Thick skin cell patches can build up in the area of your eyelids, and they may block new eyelash growth. As a result of this, you may have ingrown eyelash hair, which causes even more discomfort. Psoriasis in the eye area also weakens the skin on both lower and upper eyelids. An Entropion condition has profound effects on your eyelids. It’s most often found in elderly patients, and often is confused with trichiasis. If you have Entropion, your eyelashes actually grow normally, but the margins of your eyelids turn or flip back in towards your eye. The lower lid becomes more lax as you age, and the muscles that used to hold the lid properly may weaken. When your eyelid becomes inverted, your eyelashes can turn back in and rub your eyes. Whether you have ingrown hairs on your neck, face or eyelid, they cause bumps. Those on the skin that appear after shaving are razor burn bumps. With trichiasis, your eyelids are the body part that is affected by the bumps. 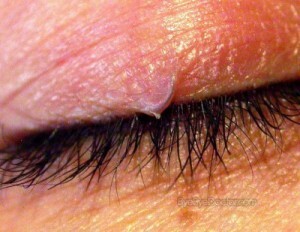 When your lash grows back into the rim of your eyelid, it causes inflammation and irritation. Don’t pop eyelash pimples or bumps. That could cause additional swelling and make the area even more painful. Eyelids swell for various reasons, including irritation and infection. Swollen eyelids are common with blepharitis. The eye itself may also be irritated and create a burning sensation. Even if the hair is in the corner of your eye, growing backwards may cause an abrasion to the cornea. If you feel like you always have something in your eye, this could be the result of an eyelash growing inward. This may cause redness, constant watering and feeling like you need to rub your eye. Other ingrown eyelash symptoms on both lower and upper eyelids include constant watering, blurred vision, a feeling that something is in your eye, and inflammation of eyelash follicles. Inflammation causes pain in your eyes. Eyelashes that grow inward may scratch your eye. This causes pain whenever you blink. The actual source of the pain is a corneal abrasion caused by ingrown eyelashes. The hair in your eye feels like any other foreign object there. When you blink, your eyelid rubs the ingrown eyelash, causing pain. Your physician can remove or pluck the bent or ingrown eyelash. Do ingrown eyelashes resolve on their own? Do backward growing eyelashes fall off or stop hurting if you don’t treat them? Removing lashes that grow abnormally is the main solution to rid you of the bumps, corneal abrasion and pain. Below, we discuss various treatment options for trichiasis, and removal methods that can be used. Warm compresses work well to relieve swollen eyelids. They increase blood circulation and promote faster healing. Use a piece of cloth and warm water to create a compress. Apply it to the irritated eyelids for roughly 10 minutes. Repeat two times per day until relief is achieved. Warm compresses only get rid of swelling and some of the pain. The hair will need to be removed in order to achieve true healing. Removing backward growing eyelashes is more permanent than compresses. It even helps to prevent further incidences of trichiasis. Some misdirected growing may be a recurring problem, causing additional corneal abrasion. There are various methods to remove ingrown eyelash hairs, including plucking with tweezers, electrolysis and laser surgery. Removing eyelashes that are growing back toward the eye is something you can do at home, but only if you understand how it’s done. We recommend consulting with your eye doctor for proper help. This is only a temporary way to heal trichiasis, and the misgrowing eyelashes may recur. In fact, a plucked eyelash may grow back (the wrong way) after just a few weeks, causing repeated irritation. This method utilizes high frequency electrical current. It gets rid of the ingrown eyelashes. It sometimes proves less than effective. You may also develop scars on adjacent eyelid rims. In addition, it may further irritate your eye. Surgery is often successful for removing ingrown eyelashes and treating trichiasis. When performed with anesthesia, surgery can change the growth of eyelash direction or remove abnormal eyelashes permanently. Most eyelash surgery for ingrown eyelashes is completed safely and quickly. Since it can be permanent, that makes it a valuable choice. The downside to surgery for ingrown eyelashes is the cost, which may be high, depending on where you live and the doctor you choose. Cryosurgery utilizes liquid nitrogen, and freezes affected lashes. If you have the lash removed first, this procedure prevents a new follicle growing in its place. However, this treatment is only used on particular eyelash segments. Ingrown eyelash hair most often occurs on upper eyelids. However, it can occasionally affect the lower lids, too. If you have an infected eyelash, it usually causes a cyst. This is something you need to speak with a physician about, to drain and remove the cyst. Check out this VIDEO to see the removal of a DOUBLE ingrown eyelash! Wait ‘til you see the end!